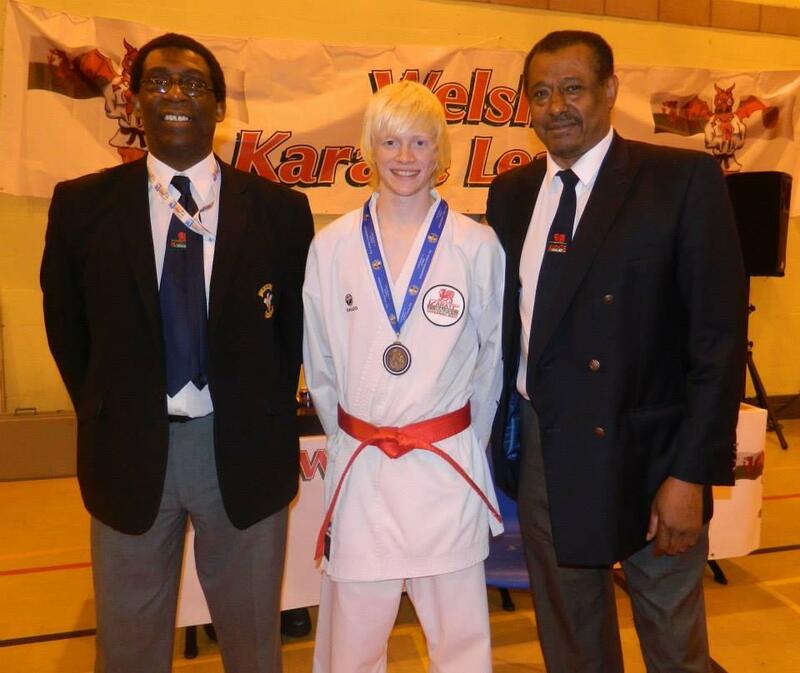 My first interview is with respected Karateka, Welsh International Luke Howard who is the current IKU Senior World Champion. Many thanks for taking the time out to speak with me. I started karate around 15 years ago at the age of 6. My parents thought it was very important to be involved in sport and had me try out various sports, but once I tried karate I seemed at home and we knew it was the sport for me! Karate has been an important part of my life as I have travelled, fought in and seen many countries around the world such as Brazil, Italy, Slovenia, Romania and Portugal to name a few. Karate has also developed and disciplined me as a person as well as an athlete and has prepared me for many aspects of everyday life. What are your upcoming plans within the karate world? With karate Wales being affiliated to the IKU, WUKF and now the UWK (United World Karate) we have many opportunities and events available to us over the upcoming year and future! I plan on attending many of these Events next year, especially the 1st UWK World Championships which will be held in São Paulo, Brazil and will be a big step forward for the karate World. In the future I would also like to continue my karate career into teaching and coaching karateka to enjoy the lifestyle and success that I have had myself! You’ve recently come back from Poland, can you tell us a bit about your visit? My visit to Poland took us to the city Szczecin for the WUKF Junior World Championships. Having turned 21 in August earlier this year, I was unable to enter the event, but still travelled out to support and help coach the squad. It was a different experience being on the coaches side of the squad, but was as rewarding helping to coach some promising young athletes to World medals and titles! What is your proudest moment throughout your karate career? 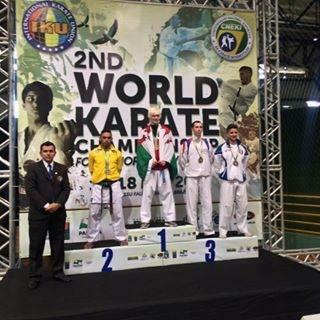 My proudest moment in karate so far has to be winning the IKU senior world championships earlier this year in Brazil! After winning the under 21 World Championships just 6 months earlier I thought it would be a hard feeling to beat, but after some extremely tough and challenging fights with athletes from all over the World, to come out as IKU World Champion, especially in Brazil, was a very proud moment for me! Another very proud moment was just recently in London at the IKU Junior European championships where I was coaching with karate Wales. I was honoured to present medals to many talented fighters including some friends such as European and World Champions Maddie Moore and Shauna Carroll. You recently did a seminar with an old training friend of mine Sensei Tom Davies at his South Staffs Karate club, was that your first seminar? Tom invited me up to South Staffs Karate to take a seminar shortly after Brazil and it was an honour to be invited up for my first seminar! There was a very friendly and welcoming atmosphere and I thoroughly enjoyed working with the students there seeing plenty of potential showing through. I look forward to taking many more seminars and helping aspiring young karateka to achieve their goals and dreams! I train 5 nights a week at the KenBuKan Martial Arts Centre in Swansea under Welsh karate legends Stephen and Unel Wellington. In addition to this I am busy being away most weekends to compete at various events in Britain and Internationally! Do you have a favourite technique? Ura Mawashi geri is my favourite technique although I understand the necessity of being proficient in all aspects and techniques in Kumite, I’ll always have a soft spot for kicks in general but most of all hook kicks! 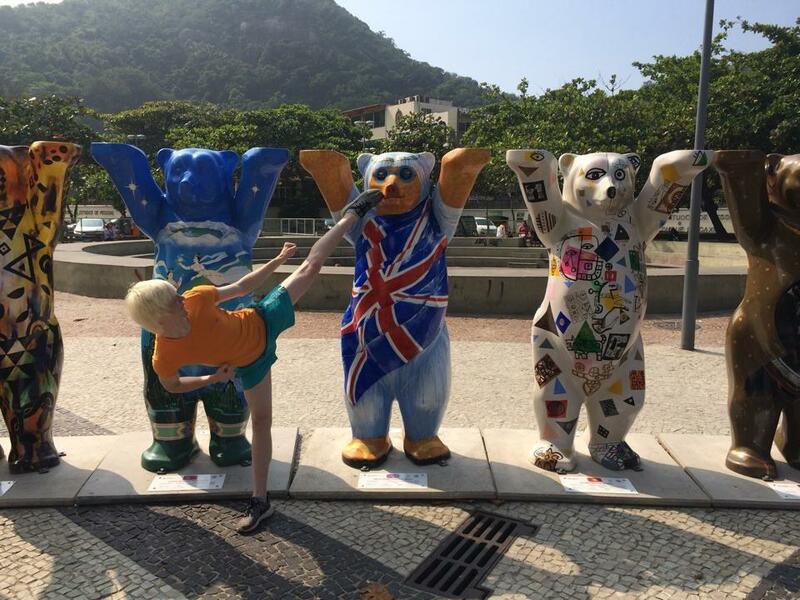 Do you have any viewpoint on karate being in the Olympics? I think it would be great if karate achieved the Olympic dream, but with the division it faces at the moment I don’t think there is much hope for that. A great chance for unity in karate comes with the recently formed United World Karate (UWK) having been formed by 7 major World bodies working towards that Olympic dream! It would benefit karate and all karateka greatly if it achieved inclusion into the Olympics, but the only way forward is through total unity. Do you prefer Kata or Kumite? I only compete in Kumite at competition as fighting is my passion, but I also thoroughly enjoy kata as well. I think Kata and basics are very important in helping fighters develop. I train frequently in Kata as well as Kumite. There will be a lot of young Karateka hoping to be the next Luke Howard, what advice can you give them? 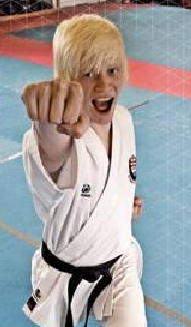 The main advice I can give to young karateka is to train hard, compete frequently and keep challenging yourself! It’s good to practice and try out new strategies and techniques so you have a wider range of techniques to use in Kumite.